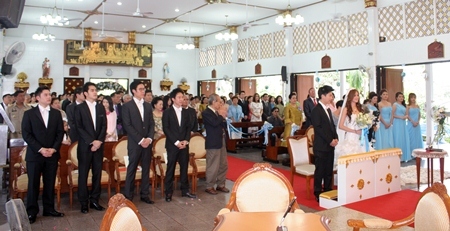 At a solemn ceremony held at St Nikolas Church on December 8, Pattaya’s most eligible bachelor Vathanai Vathanakul exchanged marriage vows with the love of his life, the most beautiful Ummarapas Julkasian, promising to have and to hold forever and ever. 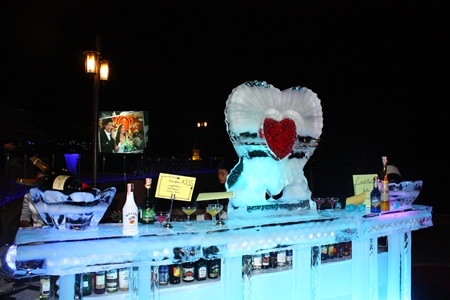 That same evening a grand reception was held around the Infiniti pool of the Royal Cliff Beach Hotel which was considered by one and all to be a most stunning affair. 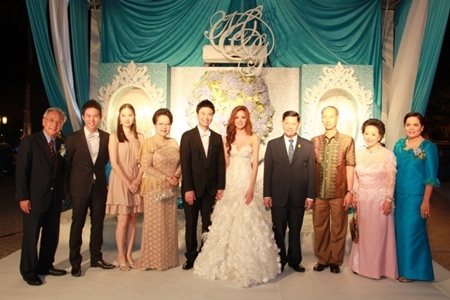 Deputy Prime Minister of Thailand and Minister of Tourism and Sports Chumpol Silpa-archa (4th from left) presided over the wedding of Royal Cliff’s Vice-President Vathanai Vathanakul (5th from left) and his beautiful bride Ms. Ummarapas Julkasian (5th from right) at the Royal Cliff Beach Hotel’s Infini Poolside. 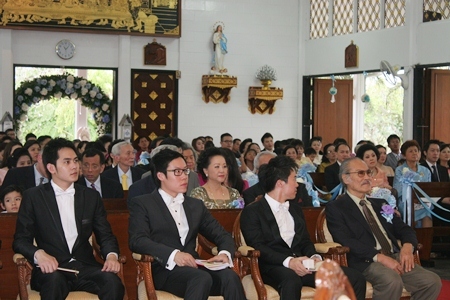 Pictured here are the groom’s mother Panga Vathanakul, Managing Director of Royal Cliff (2nd from right), father Chan Vathanakul (far left) and brother Vitanart Vathanakul, Executive Director of Royal Cliff (2nd from left). 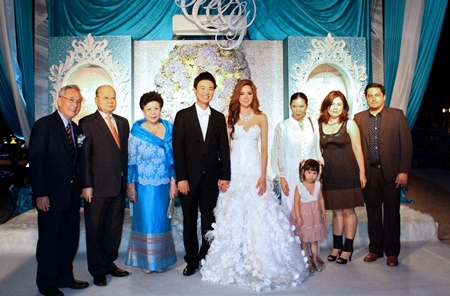 Also in attendance are the bride’s mother Mrs. Uthaiwan Threetanyutakul (far right), Chonburi Governor Khomsan Ekachai (3rd from right) and Chumpol’s wife Mrs. Duangmal Silpa-archa and daughter (3rd and 4th from left). Leading the list of who’s who were guest of honour Chumpol Silpa-archa, Deputy prime Minister and Minister of Tourism and Sports along with a bevy of movie stars and business leaders from all over Thailand and overseas. Vathanai is the son of Panga and Charn Vathanakul owners of the Royal Cliff Hotel Group. 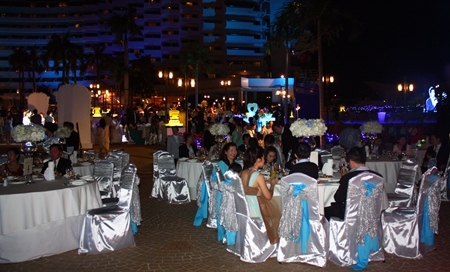 He is currently the Vice President of the family-owned 5 star world renowned property. His most beautiful bride Ummarapas is a former beauty queen and presently a star on many TV shows. His Excellency Chumpol Silpa-archa blesses the bride and groom during the reception at the Royal Cliff. 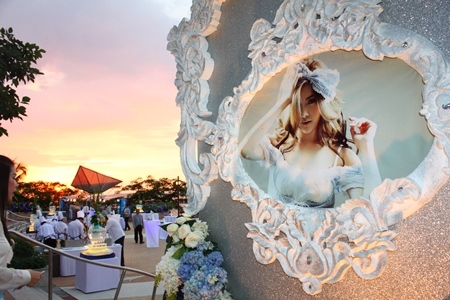 The Pattaya Mail Media Group wishes the newlyweds many happy years of marital bliss. The bride and groom cut the wedding cake to celebrate their marriage. The lovely bride arrives, waiting to be swept away by her handsome groom. 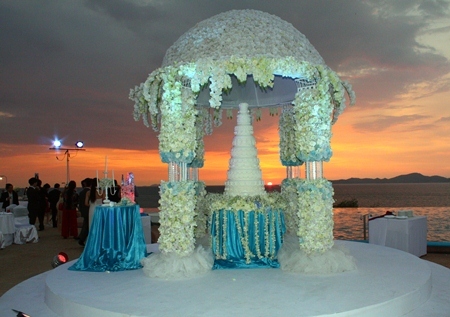 A beautiful sunset provides the backdrop for the virgin wedding cake. 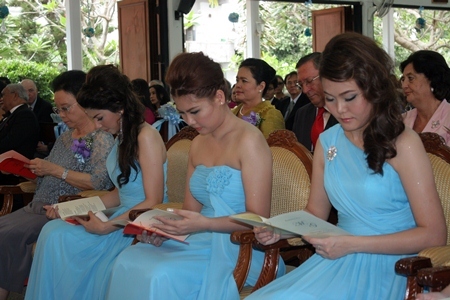 Ushers and bridesmaids make their way down the isle. 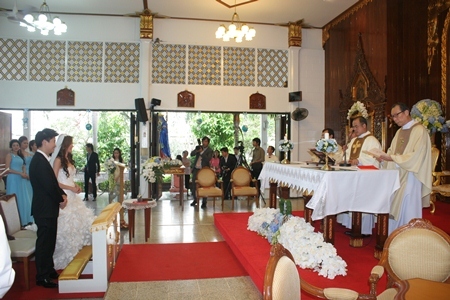 Revered priests celebrate mass in preparation for the wedding ceremony. The happy couple makes their way to the church in a white Ferrari. 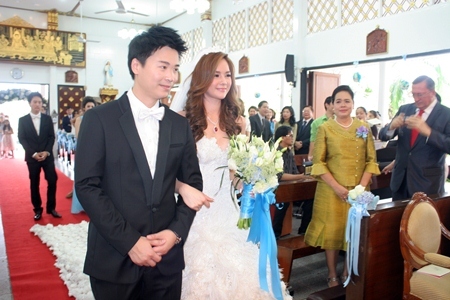 It’s all pomp and circumstance when the couple arrives at the church. The handsome couple arrives at the alter, ready to announce their vows.